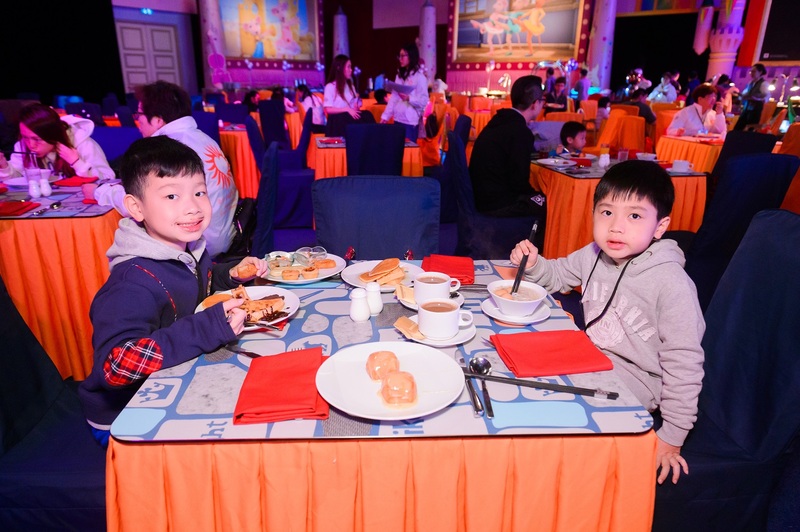 (Macao, March 20, 2018) – Around 40 children and their families from YMCA of Macau enjoyed breakfast with Thomas & The Little Big Club ALL STARS Saturday at Sands® Cotai Central, hosted by a group of Sands China Care Ambassadors. 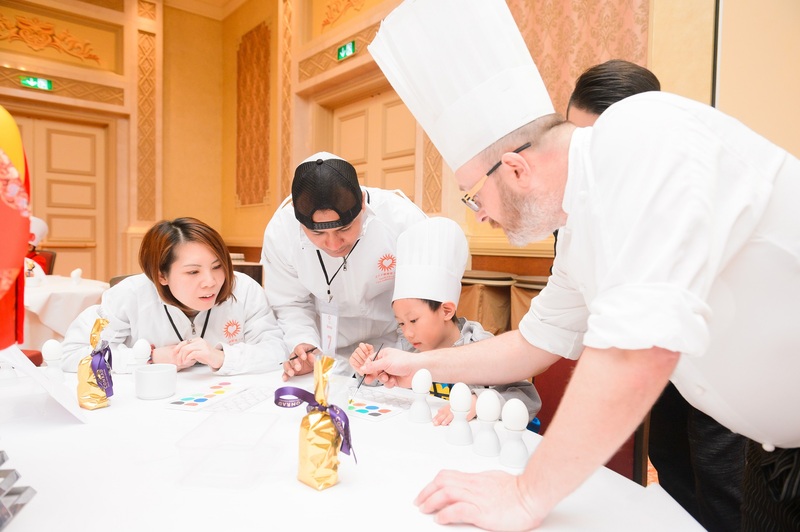 With Easter approaching, Sands China’s community event included a festive egg painting activity after the themed character breakfast, with the children wearing chef’s hats specially prepared for the occasion. 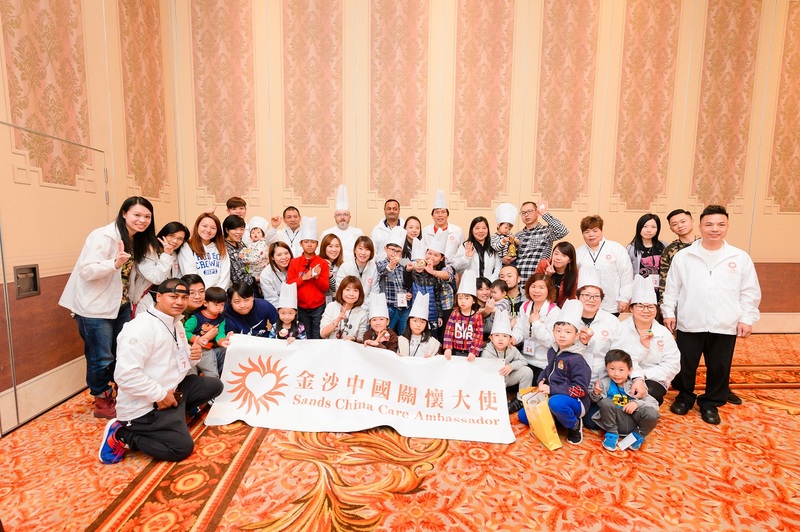 They were assisted by the Sands China Care Ambassadors and by Sands Cotai Central’s executive pastry chef, who gave a lesson on egg painting and provided samples of painted eggs to spark the children’s creativity. The children were able to take home their completed Easter eggs to help celebrate the upcoming holiday with their friends and families and kept their chef’s hats as a memento of the experience. The children and families participating on Saturday came from YMCA of Macau’s Shek Pai Wan Youth Service Team, Vila Lok Tou, and Youth Community Center. Founded in August 2009, the Sands China Care Ambassador programme aims to give Sands China employees an opportunity to serve the local community by organising community activities and initiatives that work toward creating a better Macao. With a current membership of more than 1,600 volunteers from across all Sands China properties – Sands® Macao, The Venetian® Macao, The Plaza™ Macao, Sands Cotai Central and The Parisian Macao – the Sands China Care Ambassadors contributed close to 12,000 hours of voluntary community service in more than 50 activities in 2017. Sands China Ltd. considers initiatives like Saturday’s community event with YMCA of Macau as central to its commitment toward social causes and community involvement; it is one of the many ways the company’s team of volunteers expresses its care and spreads warmth to vulnerable and less-advantaged groups in the Macao community. More information about YMCA of Macau is available at www.ymca.org.mo/intro.php. Information about Thomas & The Little Big Club and the Thomas Friendship Breakfast with The Little Big Club ALL STARS is at www.sandscotaicentral.com/thelittlebigclub.html. Sands China’s community work is part of Sands Cares, the global corporate citizenship programme of parent company Las Vegas Sands Corp.
Photo caption: Children and families from YMCA of Macau enjoy breakfast with Thomas & The Little Big Club ALL STARS Saturday at Sands Cotai Central, hosted by a group of Sands China Care Ambassadors. Photo caption: Assisted by Sands China Care Ambassadors and Sands Cotai Central’s executive pastry chef, children and families from YMCA of Macau paint Easter eggs at Sands Cotai Central Saturday. Sands China Ltd. (HKEx: 1928, Sands China or the Company) is a Cayman Islands registered company and is listed on The Stock Exchange of Hong Kong Limited. Sands China is the largest operator of integrated resorts in Macao. The Company’s Cotai Strip portfolio is comprised of The Venetian® Macao, The Plaza™ Macao, Sands® Cotai Central and The Parisian Macao. The Company also owns and operates Sands® Macao on the Macao peninsula. The Company’s integrated resorts contain a diversified mix of leisure and business attractions and transportation operations, including large meeting and convention facilities; a wide range of restaurants; shopping malls; world-class entertainment at the Cotai Arena, The Venetian Theatre, The Parisian Theatre and the Sands Cotai Theatre; and a high-speed Cotai Water Jet ferry service between Hong Kong and Macao. The Company’s Cotai Strip portfolio has the goal of contributing to Macao’s transformation into a world centre of tourism and leisure. Sands China is a subsidiary of global resort developer Las Vegas Sands Corp. (NYSE: LVS). For more information, please visit https://www.sandschina.com/. A firm believer in the importance of corporate social responsibility, Sands China Ltd. engages with the local Macao community as a part of Sands Cares – the corporate giving programme of parent company Las Vegas Sands Corp. Sands Cares integrates the company’s philanthropic work worldwide, including financial giving, team member volunteerism and in-kind support. The Sands Cares programme seeks to make an impact on its team members and those working in the hospitality industry, the communities where the company operates, and the planet. Key areas of Sands Cares in Macao include the Sands China Care Ambassador programme for volunteering in the local community; the Sands China Academy, focused on team member training and development, and the professional development of Macao locals; and Sands ECO360, the global sustainability strategy of LVS which guides the company’s environmental sustainability initiatives worldwide. For more information, please visit www.sandscares.sands.com and https://www.sandschina.com/.